Turtle Pecan Bars have the best shortbread crust topped with crunchy pecans and ooey gooey caramel. 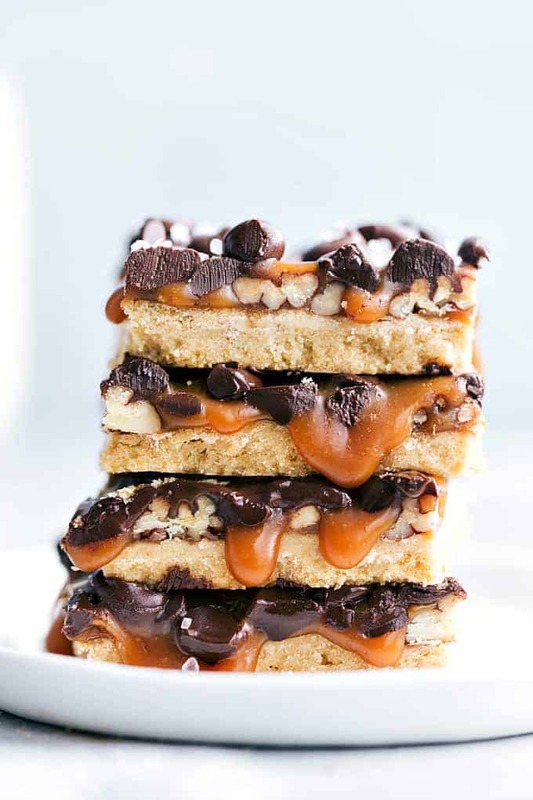 Topped with chocolate chips these bars will become a new favorite! This is my first year working with Fisher nuts brand and I couldn’t be more excited! It was a serious no-brainer to work with them because they are my go-to brand for quality nuts. They are fresh out of their shells, have no preservatives and are non-GMO Project Verified. Not only that but I love the bags that they come in. They stand up and are easy to use and are resealable so that your nuts stay fresh longer. I go through quite a few nuts, especially during the holidays. I love to add the rich color and texture to the dish that I am creating and especially love them for baking. With all of the holiday baking, I keep Fisher nuts stocked in my pantry and ready to use. And what better way to use pecans in an ooey gooey delicious chocolate caramel dessert to share for the holidays? This dessert starts with a delicious pecan shortbread crust. I love good melt in your mouth flaky shortbread crust with the flavor of pecans. Then this dessert gets topped off with even more pecans, caramel, and chocolate chips that melt on top of the dessert. Complete heaven in a dessert right here! Can you melt caramels in the microwave? I melted them in a saucepan for this recipe but you can definitely melt them in the microwave. Spray a microwave-safe bowl with cooking spray. Unwrap the individual caramel candies and put them in the bowl with the heavy cream. Microwave on high for 30 seconds stirring until melted. Takes about 1 minute. You are going to love everything about this dessert and it will be a huge hit for the holidays or any time of the year. You can’t go wrong with a pecan shortbread crust that gets topped with ooey gooey caramel, pecans and chocolate chips. This dessert is easy to make but such a crowd pleaser! It is the perfect holiday dessert. 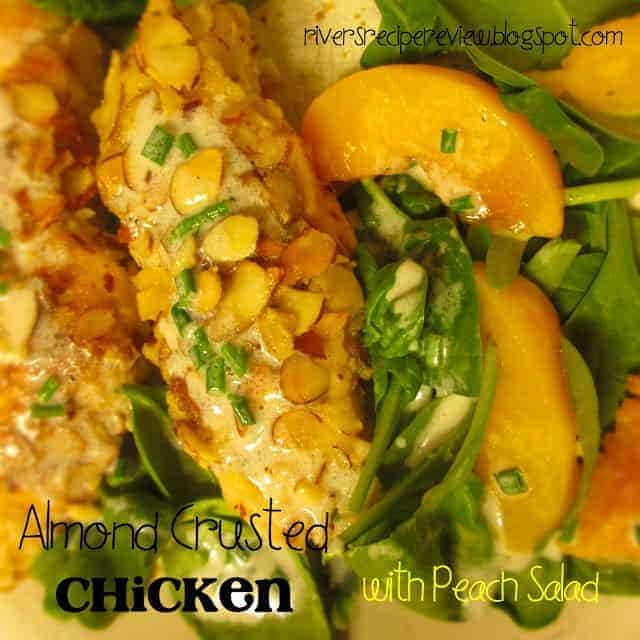 For more delicious recipes be sure to follow Fisher nuts on Facebook, Instagram and Pinterest! Preheat the oven to 350 degrees F. Line a 9 x 13-inch pan with parchment paper and set aside. Beat the butter in a large bowl until creamed and smooth. Add in the sugars and beat until light and fluffy (about 30 seconds). Add the egg yolk and vanilla and mix. Add the flour and salt and mix until JUST combined. Don't over mix. Place the dough in the pan and gently press the dough in a firm and even layer. Top with the pecan halves (no need to press them in or anything). Bake for 18-24 minutes or until the edges are very lightly golden brown. Meanwhile, combine the unwrapped caramels and heavy cream in a saucepan over medium heat, stirring constantly until the caramel is smooth. Pour over the cooled bars in one even layer. 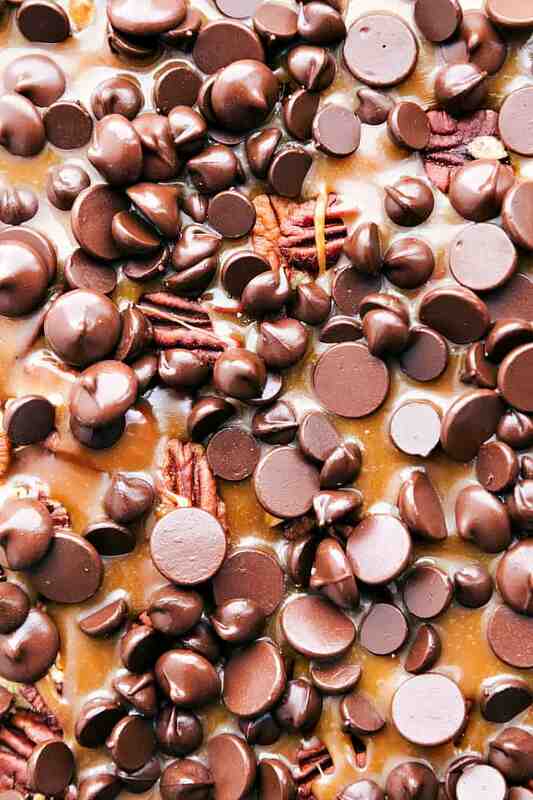 Immediately add the chocolate chips on top of the caramel so they melt and stay in place. Allow the bars to set up completely, about 2 hours, at room temperature. Cut into the bars and top with sea salt as desired. Excuse me while I drool all over the keyboard!!!!! hey girl- these bars look amazing! yummy!